If you live in a country as sunny as the Philippines, chances are that you’ve come across people wearing eyeglasses that change color when they go outdoors. These are called photochromic lenses, and the change that happens to them is because of a chemical reaction. It’s as magical as it is scientific. Photochromic lenses are better known in the Philippines as transition lenses. Other names for these color changing things of wonder are “light-adaptive lenses” or “variable tint lenses.” The name that we know it most commonly for is because of Transitions Optical, the biggest photochromic lens distributor in the world. So how do Photochromic lenses do their magic? The first prototypes of these lenses are called photogray lenses and are distributed in their brand, Bestlite. These were lenses coated with a compound of silver and copper chloride. This chemical compound was observed to be colorless in its neutral state and turn a shade darker as a chemical reaction to ultraviolet (UV) ray exposure. 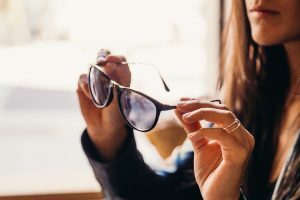 The newer models of photochromic lenses we know today are made of better and improved coating compounds, and they can do so much more than change colors. Used to be, since these lenses reacted to UV, they won’t change color when only exposed to harsh lighting (like when indoors or when the car has an anti-UV coating of its own). Nowadays, you can get photochromic lenses that have anti-reflective coating. You can also make them photosensitive so that, even in environments without UV, if there is harsh lighting, it will still turn a different darker shade. The best thing about photochromic lenses is that it’s like getting both eyeglasses and sunglasses rolled into one. You don’t have to switch between eyewear when going in or out of a facility. Also, transition lenses can be modified to your eye grade so it would be like having a pair of both prescription eyeglasses AND prescription sunglasses. What’s in your Contact Lens Solution? Transition Eyeglasses or Sunglasses: Which to Wear When?